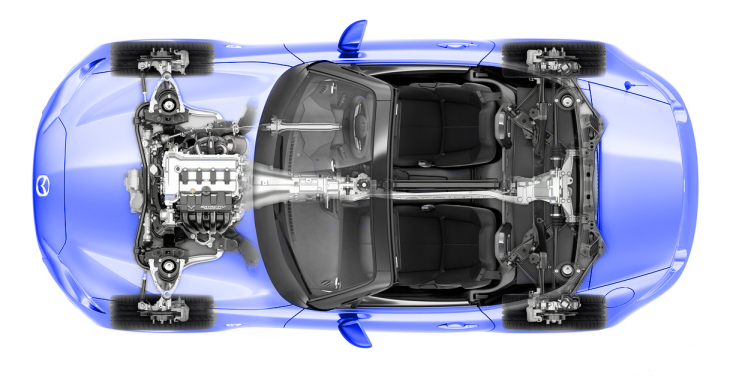 It's no surprise that the fourth gen Roadster's undercarriage follows the same tried and tested formula that has proved so successful over the years. 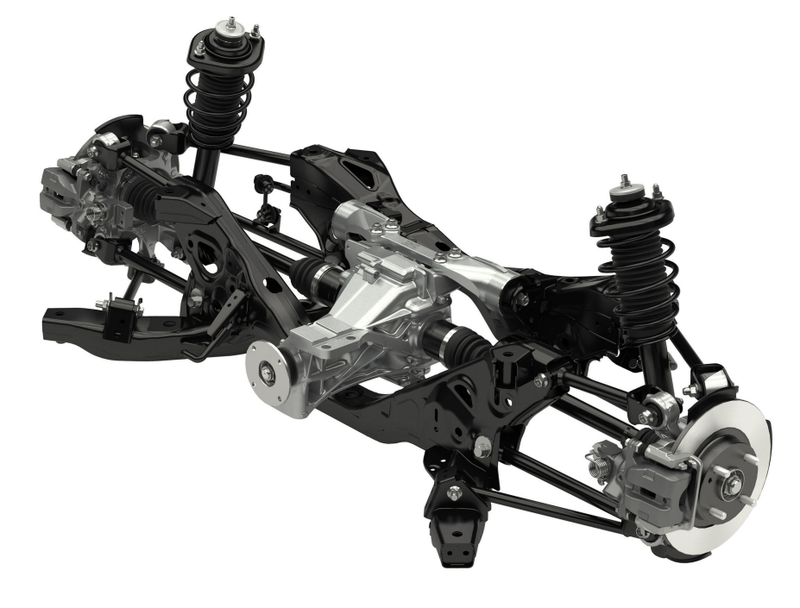 The front and rear subframes feature independent suspension and are connected together through the famous powerplant frame (PPF). It's as simple as a rear wheel drive car's chassis can get and is still reminiscent of the 1960s Lotus Elan chassis that inspired the original. 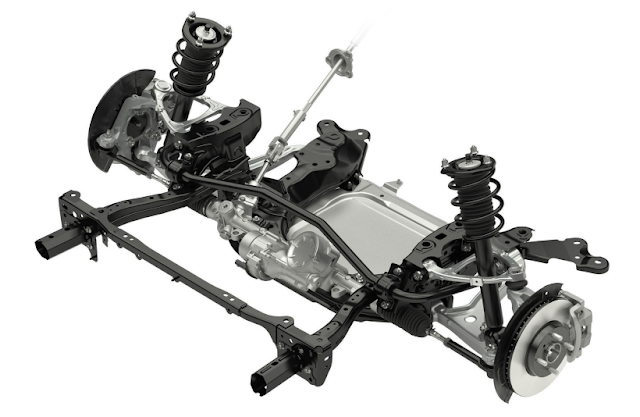 This new version is the first MX-5 chassis to be influenced by Mazda's Skyactiv philosophy. 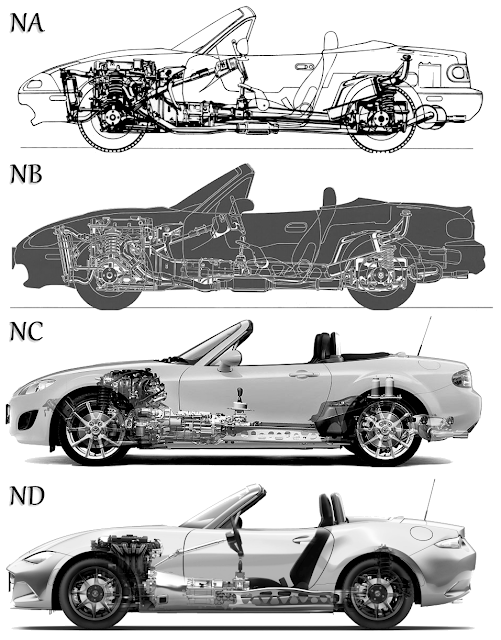 As a result, the ND chassis is a more compact design compared with that of the NC. The front-midship layout carries over with the engine mounted just behind the front axle for optimum weight distribution. The new Skyactiv-G engine sits lower and further back than before. The new engine is slightly smaller than the old MZR unit which helps give the Roadster a lower centre of gravity and permits that low sweeping bonnet design. A reduction in the front and rear overhang size has reduced the car's yaw moment of inertia. This is the most compact MX-5 we have seen yet. 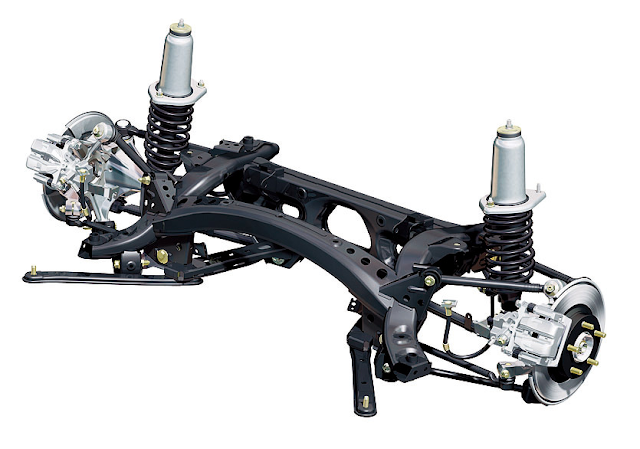 It cleverly integrates part of the body with the chassis by connecting in a skeleton truss type fashion for extra rigidity. The NC used aluminium wishbones at the front and the ND continues with these but now adds aluminium front wheel hubs, undertray, and bracing. The picture below shows the new aluminium parts in dark blue. The car's proportions have also been tweaked slightly, with the driver sitting 20mm lower and also further back in the car than before. The windscreen and A-pillars are also shifted towards the rear giving the front a more elongated look similar to the Honda S2000 and BMW Z4. The signature 50-50 weight distribution is maintained. 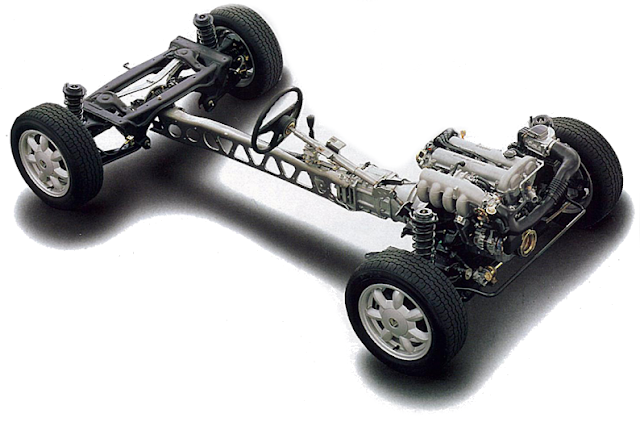 The comparison below shows how the chassis has evolved since 1989, the images are not entirely to scale but give a good indication of how the positioning of key components has changed. Here is a closer comparison of the original NA chassis with the NC and the next-generation ND. Looking at the first generation chassis, it's easy to see how the design has evolved over the years. The ride height for the Japanese market car is 140mm. 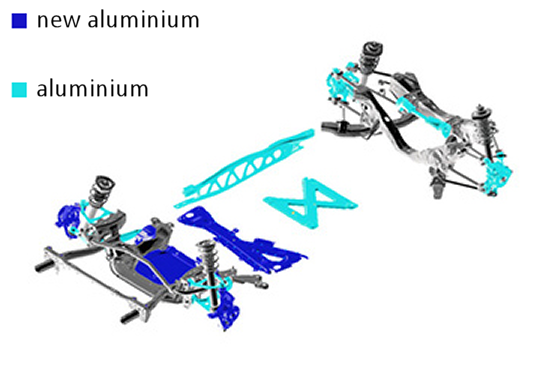 This close up shot of the front chassis components reveals the new aluminium hubs and downsized brakes. The geometry alignment at the front is fully adjustable using eccentric cam bolts. One of the new features of the ND is the electric power assisted steering (EPAS). This system uses an electric motor rather than hydraulic fluid and is able to provide varying levels of assist depending on the conditions. In keeping with Mazda's aim to lower the centre of gravity, the motor is mounted as low as possible on the steering rack itself, resulting in the oddly shaped front sway bar. Mounting the motor directly to the rack should help mitigate any vague steering feel often associated with EPAS systems. Also, since there is no power steering fluid, there's no need for a reservoir, hydraulic hoses, or pump driven by an engine belt. All of this adds up to less weight, less maintenance, and less complexity in general. The switch back to four-stud wheels reflects the aim to reduce the overall weight. A lighter car needs smaller brake calipers, smaller brake discs, smaller hubs and so on. Using smaller parts saves weight in itself creating a sort of virtuous circle, providing you know when to stop and have car still perform as intended. You can only go so far with weight reduction before the costs escalate dramatically and you look to exotic composite materials. 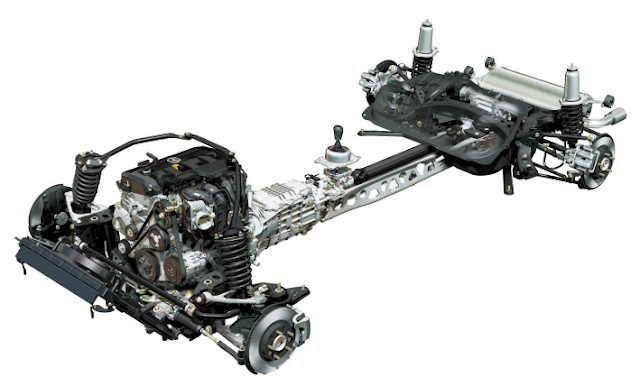 The NC front subframe is included here for comparison, note all the hydraulic power steering piping that is now gone. You can also see how the new front springs have less coils, the new lightweight aluminium undertray, and how the front subframe box section extends forward to form part of the crash structure in the bodywork. The new design rear subframe looks quite different to the NC. 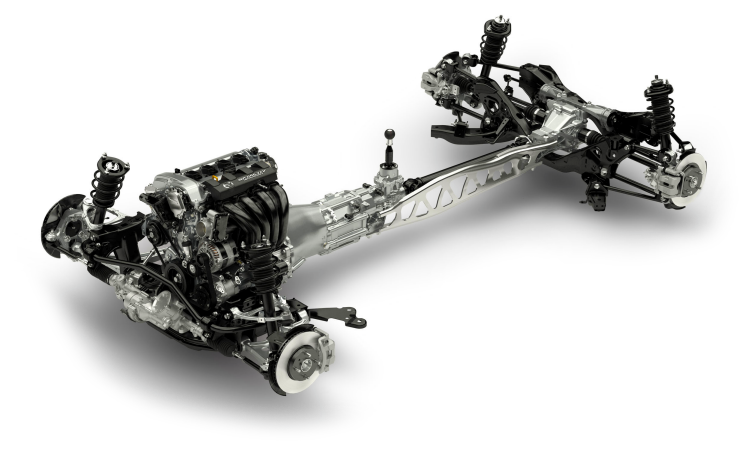 The frame as a whole is a more compact unit and further optimizes the multi-link control arm layout. 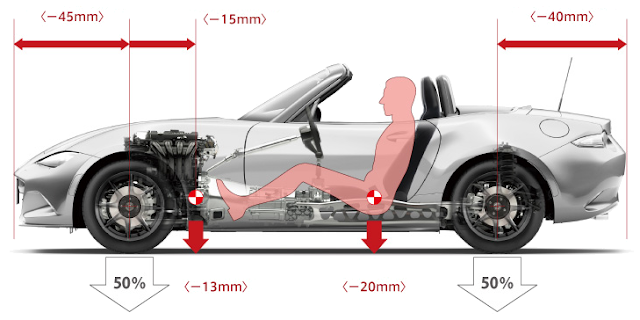 The link arms are positioned in such a way as to allow them to be shorter than on the NC to save weight. They are still fully camber adjustable using the familiar eccentric bolts allowing precise alignment settings. The new crossmembers now sit underneath the smaller differential rather than over it. Once again the rear brakes use a sold disc. 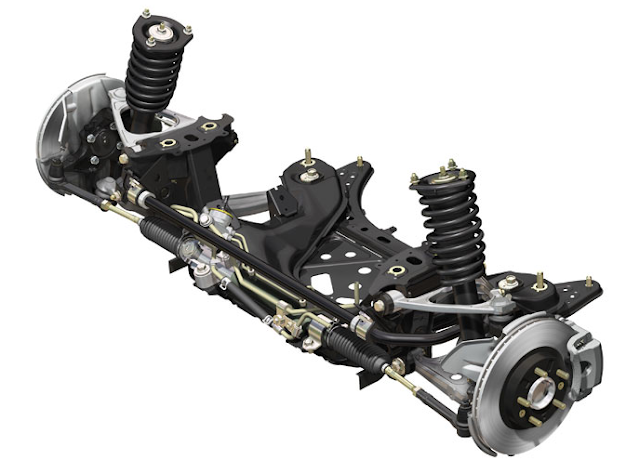 Some models will not use the rear sway bar, and will be missing a chassis brace fitted across the transmission tunnel. Both of the new subframes make use of MIG welded box section which is stronger than the spot welding used on the NC. The overall structural design is an improvement on the previous generation and gives the new chassis both greater strength & weight savings. Continuing the Roadster's long association with the German manufacturer, some markets will include the option of uprated Bilstein suspension for handling improvements.